The long awaited much-anticipated book on early Christian mysticism has finally been published. I have read pieces of this in draft since I was in graduate school (fifteen years ago), so I am particularly excited to see this in print. It clunked into my mailbox this morning. It is a huge volume put out by Compendia Rerum Iudaicarum ad Novum Testamentum. 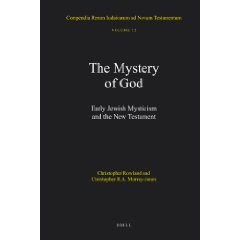 It is co-authored by Christopher Rowland and Christopher Morray-Jones, two pioneers in the study of early Christian mysticism: The Mystery of God: Early Jewish Mysticism and the New Testament (Leiden: Brill, 2009). The book is huge, almost 700 pages. There are several studies by Christopher Morray-Jones that have been revised and republished in this volume, including his important work on Paradise and Paul, and The Temple Within. There is much new here, too, including Rowland's work on New Testament mysticism as an expression of Second Temple apocalypticism, and Morray-Jones' research on the New Testament and the Kabbalah. This book brings together the perspectives of apocalypticism and early Jewish mysticism to illuminate aspects of New Testament theology. 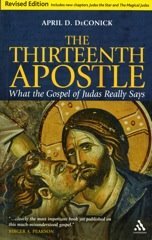 The first part begins with a consideration of the mystical character of apocalypticism and then uses the Book of Revelation and the development of views about the heavenly mediator figure of Enoch to explore the importance of apocalypticism in the Gospels and Acts, the Pauline Letters and finally the key theological themes in the later books of the New Testament. The second and third parts explore the character of early Jewish mysticism by taking important themes in the early Jewish mystical texts such as the Temple and the Divine Body to demonstrate the relevance of this material to New Testament interpretation. This book will be essential to anyone studying early Christian mysticism. John, yes a library book I think. April, I'm curious . . . does this ponderous tome contain useful information regarding reincarnation in the traditions it covers? I'm looking for some reliable scholarship on traces of reincarnation in early Christianity and the Nag Hammadi material. (I've been reading Christopher Bache's book Lifecycles, but it's not very current.) Any recommendations? HI! Not that I am aware. And I don't have a recommendation for you about reincarnation in ancient Judaism. Of course many of the Hellenistic thinkers were reincarnationalists and this was taken up by the classic gnostics, maybe Valentinians, and also maybe Origen. So it was around. Jewish sources tended to talk about cyclic incarnation of the spirit in prophetic folks, but not reincarnation as we talk about it today.